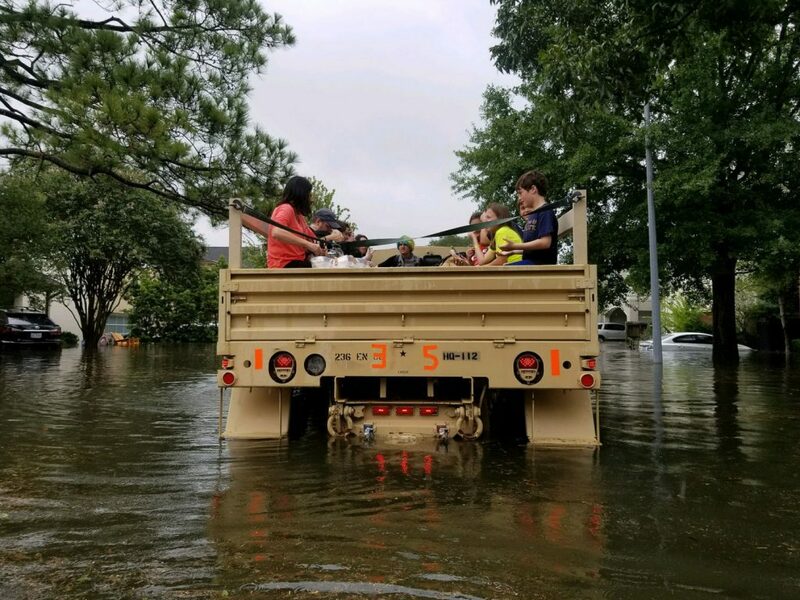 Welcome to our week in review of news and stories about Harvey recovery and flooding issues you may have missed over the last few days. If you weren’t able to check out last week’s edition, you can find it here. Feel free to share any links we may have missed in the comments. On to the news. What bond investors weren’t told about a threat facing Cinco Ranch (Houston Chronicle): Ten municipal utility districts (MUDs) in the Cinco Ranch area have had over 70 bonds sold since 1992 and only one of those disclosed a flooding risk to those neighborhoods. Harvey was three months ago. These displaced families are still in limbo (Texas Tribune): A pair of Houston families grapple with the same decisions and problems that many thousands in our area are going through a few months after Harvey. Harris County proposing dramatic overhaul of floodplain regulations (Houston Chronicle): Harris County (not Houston, for now) may require developers to use the 500-year floodplain for new development, as opposed to the 100-year floodplain as it is now. A House’s Flood History Can Be Hard To Find (Houston Public Media): Trying to find out if a home you’re considering buying or renting has flooded is often pretty difficult to do. Rental market tightens, but it may not last (Houston Chronicle): Houston’s apartment occupancy has experienced a heck of a reversal over the last few months. More volatility may be in the future. How Much Damage Did Harvey Do To Texas Homes? There May Never Be An Exact Answer (Texas Tribune): With a substantial amount of money coming in and numerous government agencies involved in the recovery effort, some things may fall through the cracks when assessing the scale of the disaster, concerning advocates. 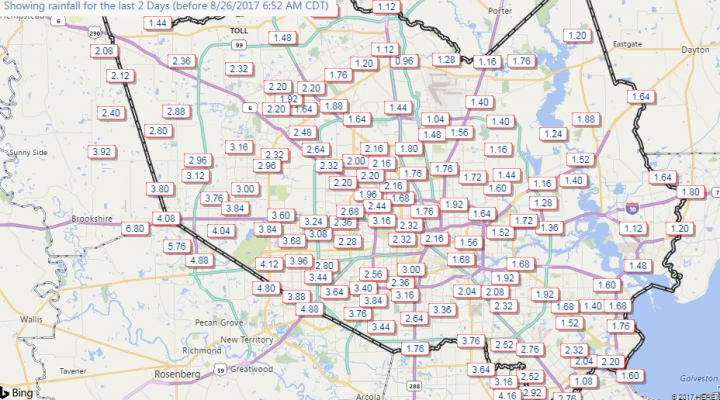 During Hurricane Harvey, I think we did a good job making pretty clear that our focus was to be on flooding. And ultimately, the majority of the damage and devastation wrought by Harvey as it moved through our region came via water. But one of the most surprising and occasionally unsettling aspects about Harvey’s impacts on Southeast Texas were the tornadoes. The warnings came fast, they came furious, and a number of them were confirmed. The fine folks over at U.S. Tornadoes put together a really nice summary of this event, which likely ranks Harvey close to or in the top ten for most prolific tornado-producing tropical systems in the United States. The Houston National Weather Service forecast office issued over 150 warnings for tornadoes through the storm. During that hellacious Saturday night and Sunday morning, over 30 tornado warnings were issued, most of them overlapping with flash flood warnings. 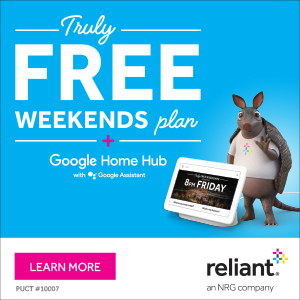 We strongly encouraged people to keep their phone alerts on that night because the frequency of tornadoes was almost shocking (and because of numerous videos of an actual tornado in northwest Harris County late that Saturday afternoon that sort of drove home the point). That, coupled with the flooding likely lead to a long, sleepless night for many in the area. I’ll have some comments about the phone alerting issue at the end of the post. First, let’s recap some of the tornadoes that actually occurred. The NWS Houston office has confirmed nearly 30 tornadoes as of September 14th, all of them either EF-0 or EF-1 strength. Here’s a look at some of the tornadoes. Tuesday, 2:05pm CT— Good afternoon. Another dreary day across much of the region as Harvey (finally!) begins to slowly pick up some speed and pull away. 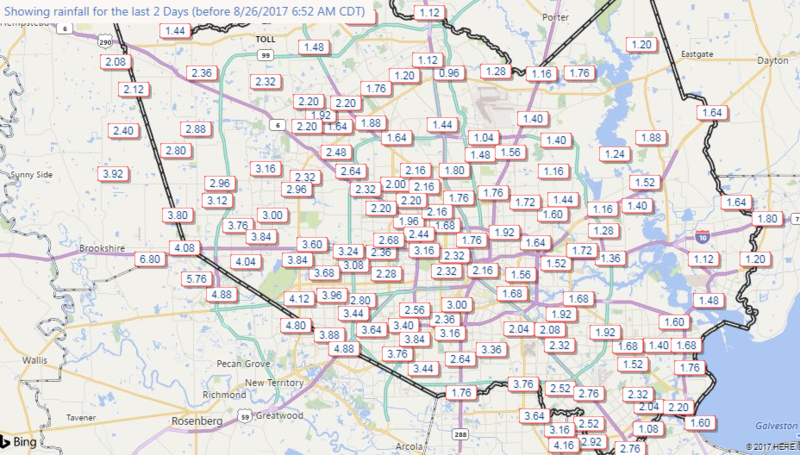 Thankfully the Houston area has seen minimal additional rains today, with most places across the hardest hit spots earlier in the week at or below one inch of new rain. Today’s hardest hit location is clearly Galveston. Harvey is a shell of what it once was, but it’s trying to take up a new lease on life as it leaves our area. Harvey has been hammering Galveston all morning with heavy rain over 7″ total today, along with strong winds. Gusts over 50 mph have occurred at times on the island. This will continue as Harvey pulls away, but with a slight downward trend eventually. Rains have really cut back around Houston, which is great news for us. Our neighbors to the east are unfortunately now in a serious predicament with extremely heavy rain pointed at the Beaumont and Port Arthur area. These areas have been similarly battered by rainfall since the weekend. 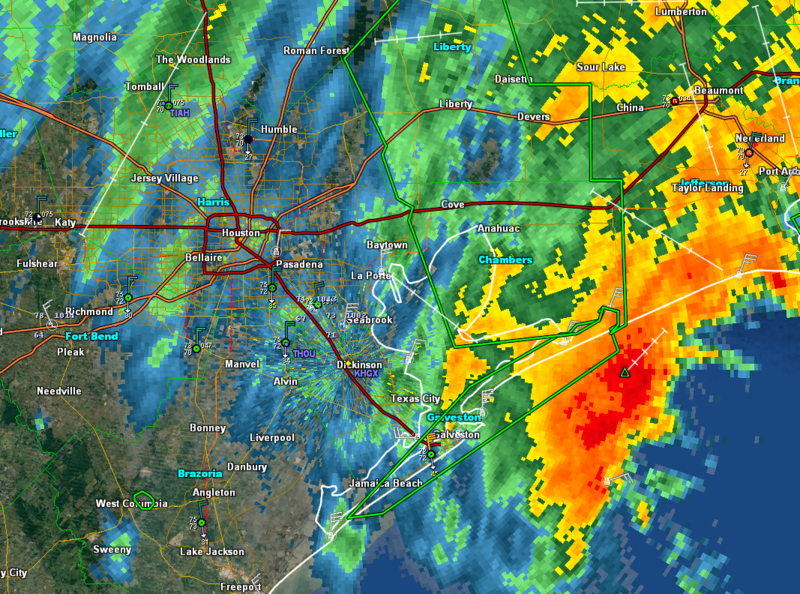 Heavy rains will lash that area through this evening, worsening a bad situation. Some additional rains may redevelop tonight over Houston, but around the city, rain totals today will be the lowest they’ve been since at least Saturday. Harvey is on its way, and it will make landfall late tonight or tomorrow morning likely in Cameron Parish, LA or near Port Arthur. We should see rain risk trend downward tomorrow with just a few showers, mostly in the morning and amounts should be mainly inconsequential as it relates to flooding. Skies may not clear out completely, but many of you will see sunshine tomorrow I project. We will stay dry into the weekend before at least some rain chances (hopefully mostly scattered stuff and nothing too organized) returns to the picture after Labor Day. We’ll have more on that once we dust ourselves off after Harvey’s exit.